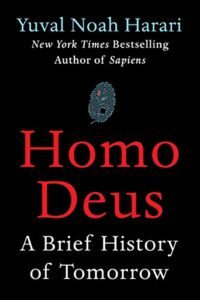 Book Review: Homo Deus by Yuval Noah Harari : Executive Leader Coach @ dbkAssociates, Inc.
Harari hits another home run. I love the subtitle of this book, A Brief History of Tomorrow. And Harari builds a solid case for his views of how the world of technology might blend with or destroy Homo Sapiens. His book is broken into three parts and takes us through human history (much more detail in Harari’s book Sapiens: A brief history of humankind), how we add meaning to the world and then how we lose control. In Chapter 1, Harari suggests that there is an entirely new agenda for human beings. What will we strive for? We have never settled for our achievements but rather we crave for more, better, faster, different. “And having raised humanity above the beastly level of survival struggles, we will now aim to upgrade humans into gods, and turn Homo sapiens into Homo deus.”—Harari, Yuval Noah. Homo Deus: A Brief History of Tomorrow (p. 21). HarperCollins. Kindle Edition. The hypothesis is that we will not be satisfied to do any less than continue down the path that technology and so-called Artificial Intelligence is paving for us. What is the difference between humans and all other animals? How did our species conquer the world? Is Homo sapiens a superior life form, or just the local bully? From these questions and Harari’s astute observations, we learn that no matter what we think, we humans will shape our world and create a religion to follow. What will the next religion be? What kind of world did humans create? How did humans become convinced that they not only control the world, but also give it meaning? How did humanism – the worship of humankind – become the most important religion of all? In Chapters 4 through 7 Harari takes us through the history of how humans created meaning for themselves through a framework of beliefs we call religion. From the storytellers to the Humanist revolution, we see how Homo Sapiens wrestle with nature and human nature for control and destiny. Can humans go on running the world and giving it meaning? How do biotechnology and artificial intelligence threaten humanism? Who might inherit humankind, and what new religion might replace humanism? Chapters 8 through 11 takes us on a journey from the time bomb in the laboratory (no free will) to the new Data Religion. In other words, “Free will exists only in the imaginary stories we humans have invented.” This undermines the story we tell about our liberal philosophy and also undermines the concept of the individual. In Chapter 11, Harari introduces Dataism. “Sapiens evolved in the African savannah tens of thousands of years ago, and their algorithms are just not built to handle twenty-first-century data flows. We might try to upgrade the human data-processing system, but this may not be enough. The Internet-of-All-Things may soon create such huge and rapid data flows that even upgraded human algorithms would not be able to handle them. When cars replaced horse-drawn carriages, we didn’t upgrade the horses – we retired them. Perhaps it is time to do the same with Homo sapiens.”—Harari, Yuval Noah. Homo Deus: A Brief History of Tomorrow (p. 388). HarperCollins. Kindle Edition. I hope you will get the book and make time to give it a thoughtful reading.